Fearless Fred and the Dragon is a stunning, poetic, and sweetly surprising picture book about a little boy and his dog as they set out into the world to find a dragon! It feels timeless yet modern, dramatic but adorable, and whisks you into the wonderfully imaginative world of childhood. Kiwis Soar Publications, 2013, Fiction. 32 pages. ISBN: 978-0-473-23482-9. Softcover. “Fred set out to be a knight with tinfoil for his armour. He took his arrows and his sword in case there was some drama. 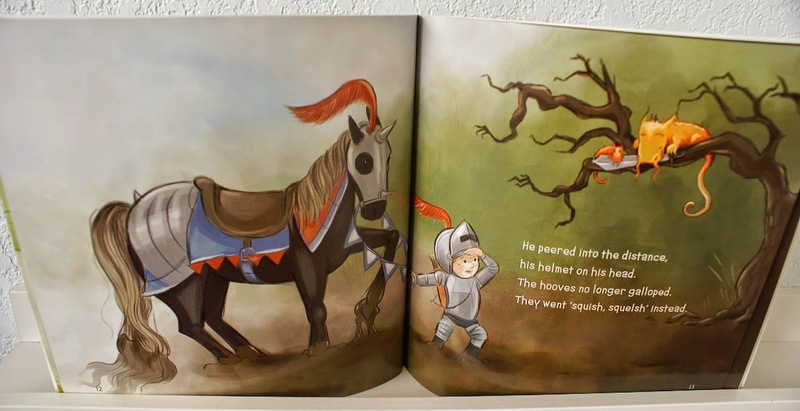 A little boy sets out into the world with his trusty dog to be a knight! 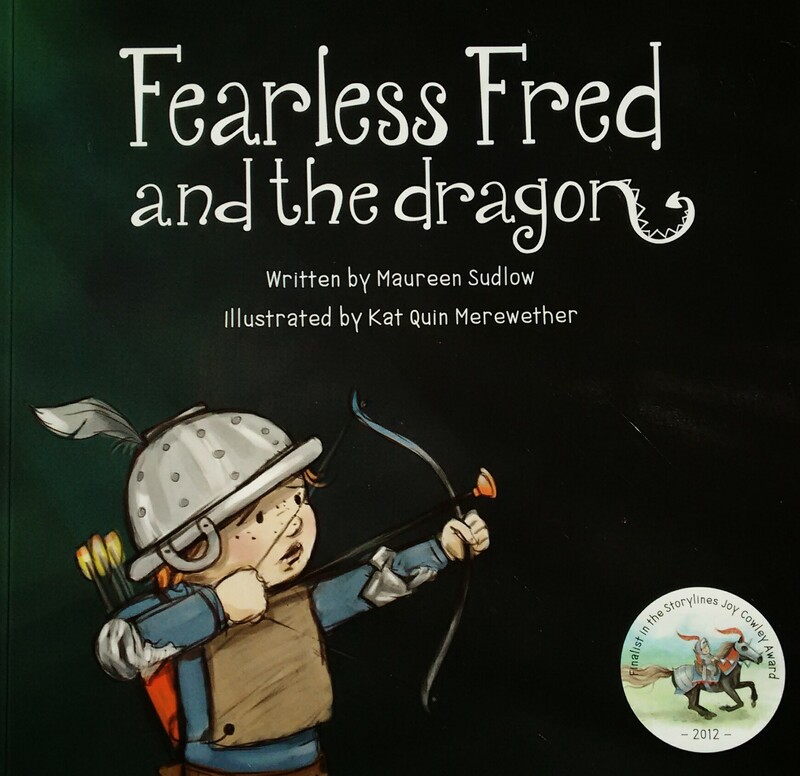 From Fearless Fred and the Dragon by Maureen Sudlow and Illustrated by Kat Quin Merewether. Interior image taken and used with permission. It is disarmingly humorous. The illustrations and poetry have such a romantic and dramatic feel to them, that when he does confront his dragon, it is so surprising you can’t help but laugh. Not giggle, not chuckle, but wholeheartedly laugh. The illustrations are magnificent and compliment the verse perfectly. Each spread of bold, rich colors alternates between what an onlooker would see with what Fred is feeling as his rides his tricycle in search of adventure. The syncopation of the poetry and the illustrations is perfectly done. This book is only good things — an adventure, a dramatic climax, and fish and chips for tea afterwards. My son could not have enjoyed this book more! He had me read it to me countless times and I’ve heard him quote lines from the book while playing. Readers of all ages will be struck by the beauty, simplicity, and universality of this book. Fearless Fred and the Dragon is a sweet book that spurs the imagination with a quiet but unique flare that could only come from the wonderful country of New Zealand. [Library] Worldcat.org – Ask your library for it. If you’re in New Zealand, many libraries have it! Author: Maureen Sudlow — wonderful site! I read it daily for a moment of peace, inspiration, and introspection. When I was a K-12 librarian, I had a group of boys who could never get enough knight stories. This looks like such a fun addition! I’m hooked by the title and cover of this picture book. Thanks for sharing! Fred has wormed his way into my heart. This looks SO fun. Thanks for sharing! The cover and illustrations hooked me. I love the use of an imagination. A sweet and daring book for young children! I love, love, love these illustrations! They’re wonderful. They match the text so beautifully!